The machine can perform sharp end cutting on the straws, ensuring all sharp ends are packed in the same direction. All machine speeds are variable. Automatic machine stop in the event of straw jamming. Automatic product counting. Product quantity preset. Once the present value is reached, the alarm will sound. All rollers are manufactured from aluminum. Suction device for sharp end waste. The machine is easy to operate with minimum trouble. 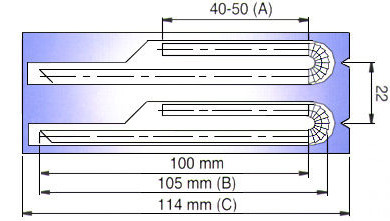 Other lengths are available Please confilm lengths (B) and (C) when ordering. This allows sharp ends of straws to wrap in the same direction. 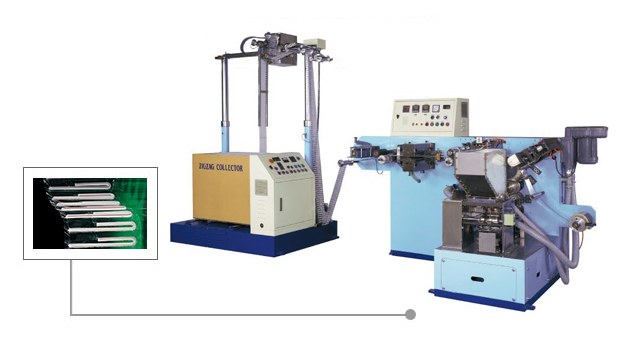 The mechanism performs waste suction, pressing and sealing operations. Copper forming pressure roller is designed with 20 cavities.